The players lead an expedition through the North-American continent. The goal is to be the first to reach the West coast. 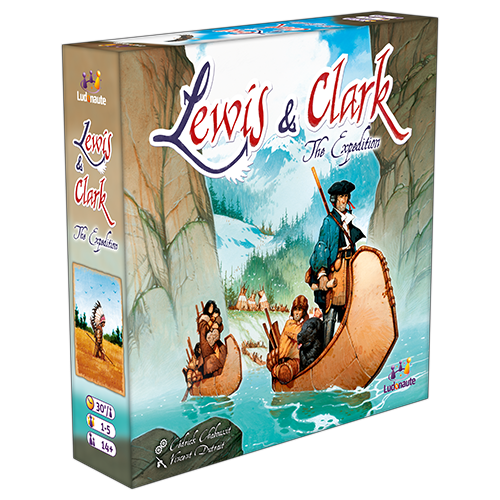 Lewis & Clark is a race game. Only the first arrived counts. Each player has Character cards in hand, that is his Expedition. These Characters allow him to perform actions such as collecting resources, moving forward on the route, asking Indians for help. To be triggered, each action must be given a Strength thanks to another card or Indians. Each round, you must perform one action. You may also recruit new Characters and, this way, improve your hand of cards. From time to time, you will set up your camp in order to retrieve the cards you have already played. When setting up your Camp, the load of your boats and the number of Indians you have may make you lose your hard won advance. 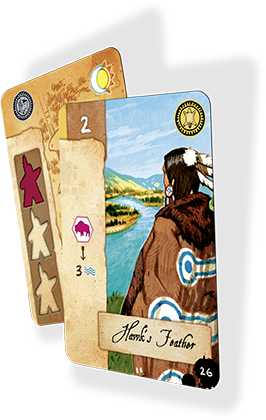 Thus a careful management of your resources and Indians is crucial in the game. The game ends immediately when a player sets up his camp in Fort Clatsop or beyond. An original theme for an intense and demanding strategic game with “handbuilding” and resources management. 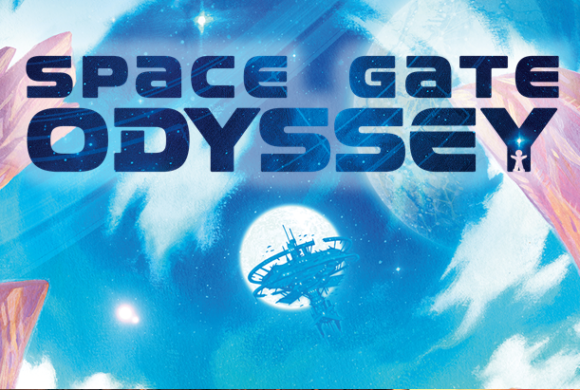 Enjoy a new great adventure each game thanks to the numerous cards’ combinations. 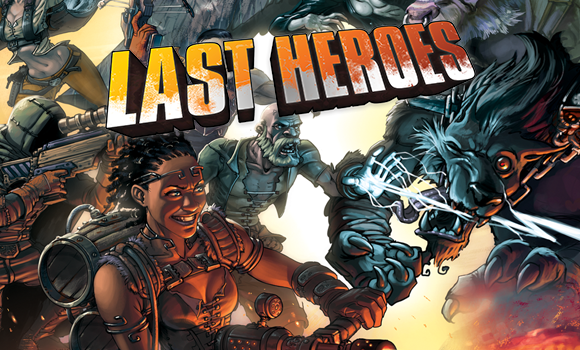 1- Discard all the Encountered Characters you have recruited since the beginning of the game. (you just keep in hand your 6 starting Characters). 2- Discard all the resources and Indians you have. It is always permissible to use only a part of the Strength (or none of the Strength) that has been given to an Action. For example: an Action that has been given a Strength of 3 could be performed twice, or once, or not at all, rather than three times. It is also permissible to take only some (or none) of the bene­fits gained from an Action, rather than all of them. When am I allowed to reorganize the resources on my boats? At any time during the game (when I buy a new boat or when I pay resources for an action for instance), I am allowed to reorganize the resource hexagons on my boats, in order to make them occupy the less penalizing boats. On the other hand, I am not allowed to toss resources overboard except of specific cases (see question below). Can I “toss my resources overboard”? No, I am not allowed to get rid of my resources except if, when collecting resources, all my boats, included those I have bought during the game, are full. In this case, I can discard them (put the resources back in the stock) in order to make room to the new resources I have just collected. The number of old resources I discard in this case equals the number of new resources I collect, so that, at the end of the Collecting action, all my boats are still full. When performing the Farewell action, can I discard only a part of the 5 cards of the Journal of Encounters (for instance only 2 cards)? No, you can’t. Discarding the 5 Character cards of the Journal of Encounters is automatic during the Farewell action, in contrast to the cards from your hand you can discard by 1, 2, 3 or even none. When I copy the action of an already played Character card thanks to Shamanism, can I use the Strength given to this card? No, I can only perform the action I copy once, whatever the Strength given to it is. Can several players add Indians into an open circle in the village (Horse Trade and Canoe Manufacturing) or is only the first player to do so who is allowed to place between 1 and 3 Indians in those spots? There is no limit to how many Indians can be in those spaces. On your turn you may place up to three Indians at a time in one of these spaces instead of the normal one. When performing the Horse trade action, can a Horse or a Canoe be used to pay for a Horse? Yes, I can pay 1 Horse, 1 Food and 1 Canoe to get a Horse for instance. When performing the Expedition Upgrade action, if the two circles are empty, may I perform the action by placing 2 Indians during the same turn, one on each circle, and in this way taking two tiles by paying 6 wood)? No, I can place only one Indian per turn on the empty circle. Those two spots can be seen as two different actions with the same effect. No two Scouts can occupy the same space. When do I have to take into account the opponents’ scouts? During my scout’s move, I do not take into account the opponents’ scouts (I go through the spots where they are as if they were empty), except if there is a scout on the final movement spot. If the final space is occupied, then my scout moves forward (or backward, in Camp phase) one additional space (whatever its type is). If the next space is also occupied, I have to move my scout one space more and so on. Are the spaces beyond Fort Clatsop river space? Yes, these spots are river spaces. Do I have to give a Strength to the permanent effect Character card (by playing another card and/or Indian meeples with it)? Yes, EVERY Character card must activated thanks to a Strentgh given by Indians and/or another card. You are not allowed to play a card without activating it. Do the Character cards with permanent effect come back into my hand when I set up my Camp, as the other cards do? Yes, all my cards come back into my hand during the Encampment phase. At the end of this phase, my playing area is totally empty. Can the Character cards with permanent effect be copied thanks to the Chamanism action or The Partisan (Character #35)? No, since their effect does not apply immediately, they cannot be copied. The Interpreter: when activating the interpreter, am I allowed not to take all the indians that are on the game board? What happen with the indians I do not want to take? I can choose not to take all the indians, but only some of them or even none. In this case, the remaining indians stay in the pow-wow area, on the game board. They are available for the following player who wants to play his Interpreter. 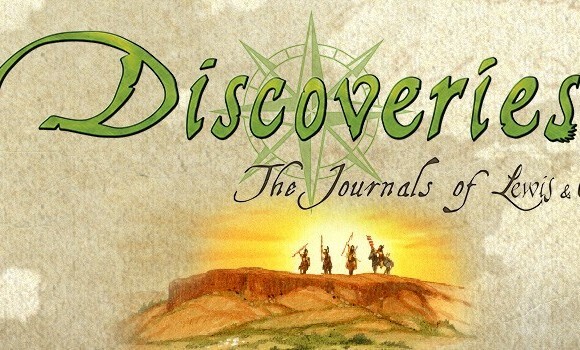 #14 Cuscalar (Pay 1 Horse and take the card of your choice from the journal of encounters) when activating it several times, do I have to refill the journal between each activation? No, I do not refill the journal between each character purchase, I refill only at the end of the action. #16 François-Antoine Laroque If this card is in my playing area and my scout is on a Moutain spot, on the last but one spot of Mountains area for instance, if the last spot in Mountain is occupied by an opponent’s scout, do I have to consider that my next move is in mountains or on the river? You have to consider your next move to be on the river. Play as if the spot on which the opponents’ scouts are simply do not exist. #36 Nicolas Jarrot (Permanent effect: add 2 spaces to one movement on the river) Does his power apply when I use the Shamanism action to activate a character who allows my scout to move on the river? #54 Cut Nose (Permanent effect: add 2 spaces to one movement in the mountains) Does his power apply when I use the Shamanism action to activate a character who allows my scout to move in the mountains? How many indians do I need in a solo game? I have to use 6 indians (3 + 3 per player). 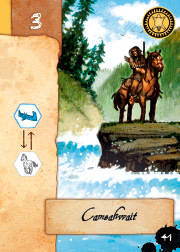 At the beginning of the gamen one indian is placed on my expedition board, one indian is placed on the Newcomer area and the last four indians form the stock. Where do I have to place Alexander McKenzie figure (one of the scout figure) at the beginning of the game? I place Alexander McKenzie on the route, on the space of my choice upriver from Saint Louis. The farthest from Saint Louis the start space of McKenzie is, the more difficult the game is. How is Alexander McKenzie figure played? At the end of each turn, I must move his figure one space forward on the route. If this space is occupied by my scout, Alexander MacKenzie moves one space more. Moreover, this figure is considered as a scout in the multi-players game: I can “jump” the spot where he his if it is the final space of my movement.